Darwin's disciples stray from their stated beliefs in purposeless evolution by using pantheism and animism, the bear dogs (amphicyonids) were not some kind of aboriginal spirits. Instead, it was a critter that is somewhat underrepresented in the fossil record. Some evolutionists think it was an ancestor of both bears and dogs, although the bear connection is weak, even according to their criteria. A couple of writers discussed how dogs and bears shared this alleged common ancestor, and then proceeded to contradict themselves by admitting that there is little or no fossil evidence to support their claims. Fake evolution news in action, that's a mite deceptive, old sons. The fact remains that animals were created to reproduce after their kinds, not to turn into something else. This is what we observe, Yippie ky yay, Darwin! The article cited paleontologist Susumu Tomiya and anatomist Jack Tseng. A search for their names found a 2016 technical report on beardogs written by them in the journal Royal Society Open Science. 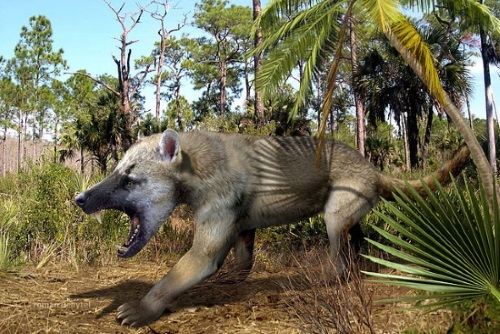 The pair re-analyzed two fossils previously labeled as generic carnivores by other scientists. New CT scans showed skull features that suggested both fossils belonged to the specific category of carnivores called beardogs. Does the name mean beardogs evolved into dogs or bears? Not at all. Here’s what I found. To read the rest, click on "Beardogs: Bears, Dogs, or Something Else?"